O Sábado dia 25 de Outubro já ficaria marcado para mim de qualquer jeito, afinal, seria nesse dia que completaria 15 anos de Kung Fu. Porém , como sempre, momentos marcantes quando menos esperamos acontecem. Sábado eu cheguei ao Mo Gun bem cedo, e por estar sozinho aproveitei para praticar um pouco, o que foi bom. Na sequência, pouco antes das 09:00 h , resolvi parar e assistir ao restante de um capítulo da novela “Ip Man” . Foi quando Clayton Meireles chegou. Ele sentou-se ao meu lado, e juntos assistimos ao episódio até o final. Rodrigo Moreira e Ailton Jordão chegaram na sequência, e fizemos o trabalho do Ving Tsun Experience com Clayton Meireles. O trabalho foi focado na mobilização interpessoal direta. A “mobilização interpessoal direta” corresponde ao momento quando o praticante mobiliza (ou leva a ação) outro praticante. Isso porque entendemos que o praticante precisa ter acesso aos dois lados da mobilização: A de quem é mobilizado e a de quem mobiliza. Si Fu certa vez deu a relação de pais e filhos como exemplo. Ele disse que enquanto você não tem filhos, você viveu apenas parte desta experiência. Ou seja, você viveu apenas na perspectiva de filho e não de pai. Finalmente chegou Jomarx Soares, praticante de 14 anos, que está conosco a 1 ano. Jomarx também trabalhou a mobilização naquela manhã. Na verdade Si Gung falou uma vez que artes marciais não são para crianças. Por isso, práticas mais aprofundadas muitas vezes ainda que a criança tenha um nível de atenção fora da média, ela não consegue se aprofundar muito. This Saturday October 25th would have marked me anyway, after all, would be the day I would complete 15 years of Kung Fu. But, as always, memorable moments happen when you least expect it. Saturday I got to the Mo Gun very early that morning, and enjoyed being alone to practice a bit, which was good. Following shortly before 09:00, I decided to stop and watch the rest of a chapter of the "Ip Man" chinese soup-opera. Clayton Meireles Meireles arrived. He sat beside me, and together we watched the episode until the end. Rodrigo Moreira and Ailton Jordao arrived afterward, and we did the work of Ving Tsun Experience with Clayton Meireles. The work was focused on direct interpersonal mobilization. The "direct interpersonal mobilization" is the moment when the practitioner mobilizes (or take someone into action) another practitioner. That's because we understand that the practitioner needs to have access to both sides of the mobilization: How to make a movement and how to lead anyone to do the same. Si Fu once gave the relation of parents and children as an example. He said that while you do not have children, you lived only part of this experience. That is, you lived only in the perspective of the son and not the father. Finally arrived Jomarx Soares, a 14 years old practitioner, who is with us for 1 year. Jomarx also worked to mobilize that morning. Si Gung actually talked since martial arts are not for children. Therefore, go deeper in Ving Tsun is too much for the child who has a level of attention away from the average, the children can not go very far. And while we are speaking of kids, I also would like to talk about the youngster Jomarx. Often eager, young age that they can not spend much time reflecting on and exploring a point until they runs out. So we were so impressed with the insight and patience by Jomarx that morning to unveil which scenario would create for Rodrigo Moreira were mobilized to work on technique "Fuk Sau." Suddenly we were interrupted by the doorbell, and when we open the door of the Mo Gun, Ailton and Clayton, who had gone downstairs to the street 30 minutes before, came along with Gabi(Ailton´s kid) with balloons , a birthday cake and soda singing "Happy Birthday to you" for me(photo). Interrompemos o que estávamos fazendo e Ailton tomando as palavras disse que apesar de a celebração do meu aniversário (biológico) e Kung Fu não poder ser mais realizado naquele Sábado, que ele e o pessoal não gostaria que passasse em branco. 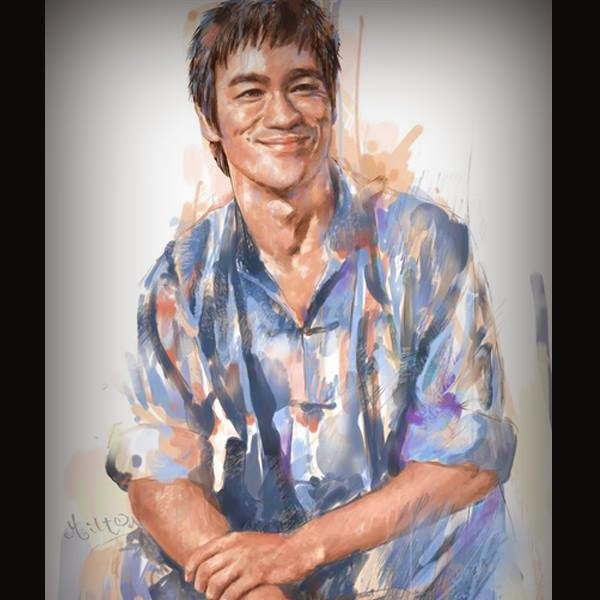 We interrupt what we were doing and taking the words Ailton said although the celebration of my birthday (biological) and Kung Fu can not be held that Saturday, he and the brothers would not want to let it pass in blank. O bolo havia sido escolhido com cuidado, pois o pessoal sabe do quanto não gosto de chocolate. Reparei que o bolo tinha velas formando o número “315”(foto). Comecei a rir e perguntei se havia virado um monge taoista imortal e não sabia. Todos riram e Ailton disse de forma bem tocante, que apesar de eu sempre frisar que momentos como esse são para celebrar a figura do “Dai Si Hing” do Méier e não do “Thiago Pereira”, ele comentou que para eles não é possível separar. The cake had been chosen with care, because people know how much I do not like chocolate. I noticed that the cake had candles forming the number "315"(photo). I laughed and asked if I had turned an immortal Taoist monk and did not notice. 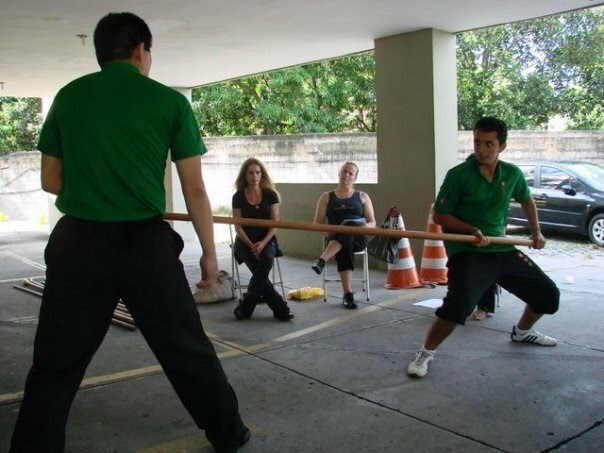 Everyone laughed and Ailton said in a very well touchingly, that although I always emphasize that moments like this are to celebrate the figure of the "Dai Si Hing" in Meier School and not the "Thiago Pereira", he commented that for them it is not possible to separate . Particularly I was very touched, not for being in evidence, but for remember Si Fu, as always. I remembered a few tenths of a second, when talking to him in 2009 about my limitation to mobilize people in Meier without his supervision, he just said after trying various approaches, "Pereira, you do things with the heart. Do You Know why I'm ok in relation to you? Because I know you do things from the heart. " Diferente das tantas vezes que a querida Paula Gama tinha organizado meu aniversário, simplesmente pelo carinho que tínhamos um pelo outro. Dessa vez, esse mesmo carinho estava presente, mas o trabalho vindo do coração também estava lá. Por isso me tocou bastante. Unlike so many times that dear Paula Gama had organized my birthday, just for the affection we had for each other. This time, the same care was present, but the result of the work from the heart was there too. So touched me greatly. Certa vez, indo contra tudo que os ecologistas nos ensinam, eu cheguei em casa numa tarde de Novembro, vindo da escola quando tinha 15 anos, e estava com muito, mas muito calor! Naquele Sábado dia 25, eu estava muito cansado e com muito calor, mas não fiz essa coisa da cadeira no chuveiro. Apenas tomei um banho demorado, e sentei pra tocar violão. Fiquei tocando por duas horas, e finalmente troquei de roupa para buscar minha namorada. 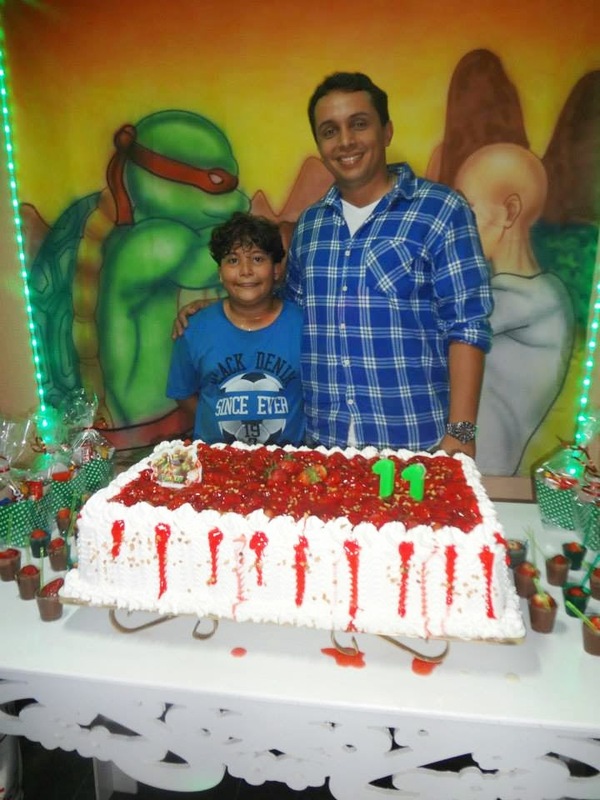 Pois a convite de Dona Miriam , íamos com Rodrigo Moreira e Ailton Jordão ao aniversário do Maicon Amaro, praticante do módulo “Siu Ye Kuen” (para jovens entre 7 e 12 anos). Once, going against everything the environmentalists tell us now, I came home one afternoon in November, from school when I was 15 years old, and was very, very hot in that sunny day! On that Saturday , I was very tired and feeling hot again, but I did not do this thing in the shower. Just took a long shower, and sat down to play the guitar. I was playing for two hours, and finally changed clothes to get my girlfriend. 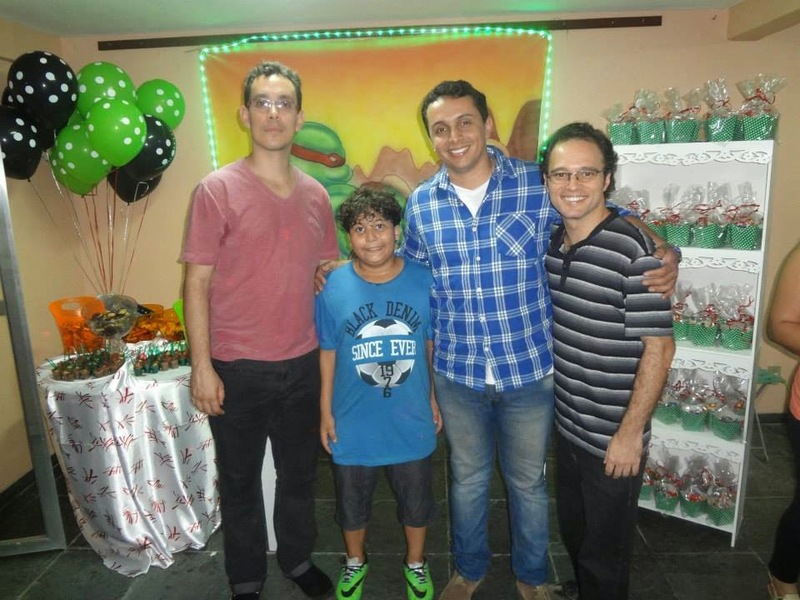 For the invitation of Mrs. Miriam, going with Rodrigo Moreira and Ailton Jordao, to her son´s anniversary. 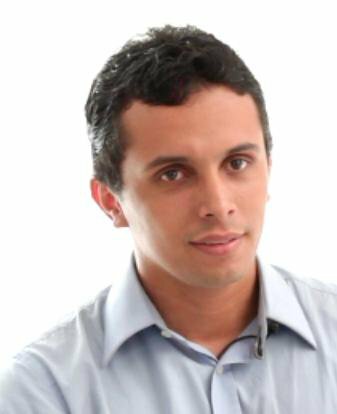 Maicon Amaro is a practitioner of "Siu Ye Kuen" a module for young people aged 7 to 12 years old). Eu e minha namorada encontramos Rodrigo Moreira em frente ao clube Mackenzie do Méier e fomos para a festa. Ailton chegaria um pouco depois com esposa e filha vindo de Bangu. O Condominio do Maicon fica bem próximo ao Mo Gun, porém, é um daqueles lugares legais que você nunca desconfia que existem tão próximos. Com um espaço impressionante, vimos bastante crianças correndo por todos os cantos, e fomos nos guiando por elas para chegar ao salão. De repente, Maicon passou correndo. Tive que ser rápido para pegá-lo enquanto passava como uma flecha. Ele nos levou até o salão onde estavam seus pais. Como sempre , fomos recebidos com muito carinho pela família Amaro. My girlfriend and I met Rodrigo Moreira in front of the club Mackenzie in Meier neighborhood and went to the party. Ailton come a bit later with his wife and daughter coming from Bangu neghborhood. Very far away. 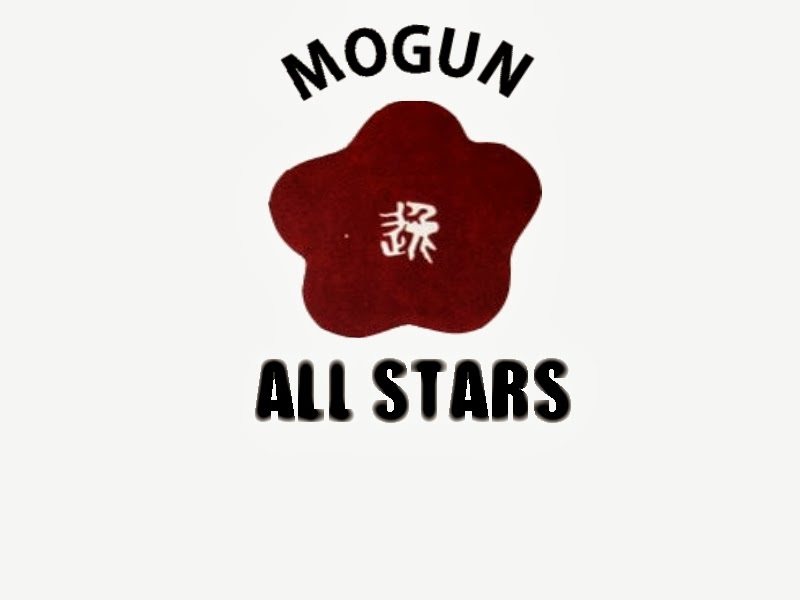 Maicon's place is right next to Mo Gun, however, is one of those cool places you never suspect that there is so close. With an impressive space, we have seen enough kids running everywhere, and we let they keep guiding us through to get to the salon. Suddenly, Maicon showed up running too. I had to be quick to catch him as he passed like an arrow. He took us to the room where his parents were. As always, we were greeted with great affection by the Amaro family. 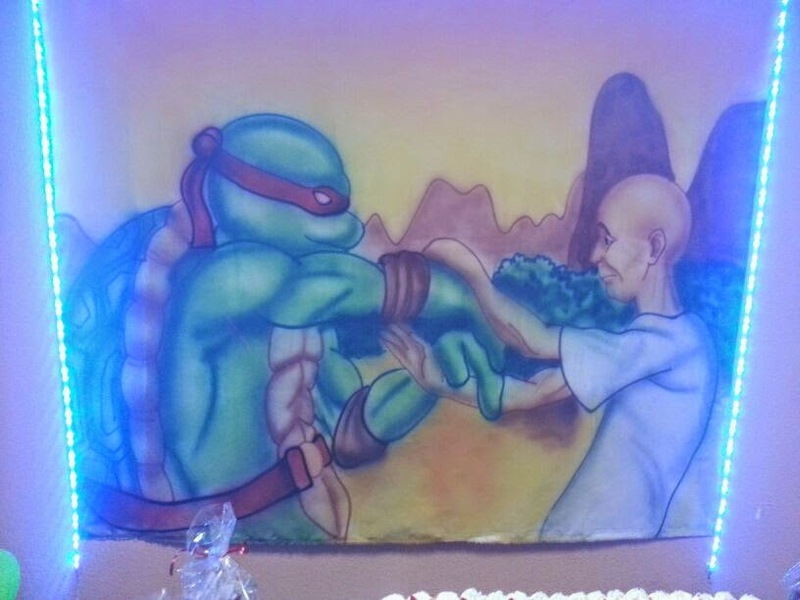 Quando entramos no salão, algo me chamou a atenção na mesma hora: Um painel de Ip Man fazendo Chi Sau com a Tartaruga Ninja Raphael!!! Rindo bastante, vi o quanto a pessoa tinha feito um ótimo desenho. Sentamos para conversar e logo depois chegou Ailton Jordão. When we entered the room, something caught my attention right away: A panel of Ip Man doing Chi Sau with Ninja Turtle Raphael !!! Laughing a lot, I saw how much the person had made a great drawing. Sat and soon after arrived Ailton Jordao. Tiramos fotos com Maicon , presenciamos toda a dedicação de seus pais com seu aniversário, e foi interessante mais uma vez lembrar-me do Si Fu. 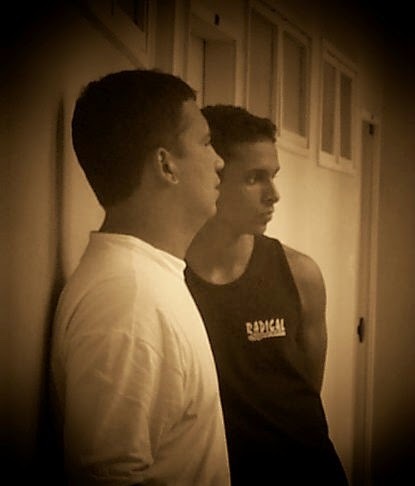 Eu não sei para você que lê o Blog se é possível contar quantas vezes eu escrevo: “E aí lembrei do Si Fu...” ..rsrs Mas é que em um momento como aquele na casa do Maicon, não só eu, como também Ailton e Rodrigo, estávamos ali recebendo tanto carinho, pelo fato de que um dia, Maicon assistiu “O Grande Mestre” (ip Man, 2008), quis fazer Ving Tsun a qualquer custo e nos encontrou. 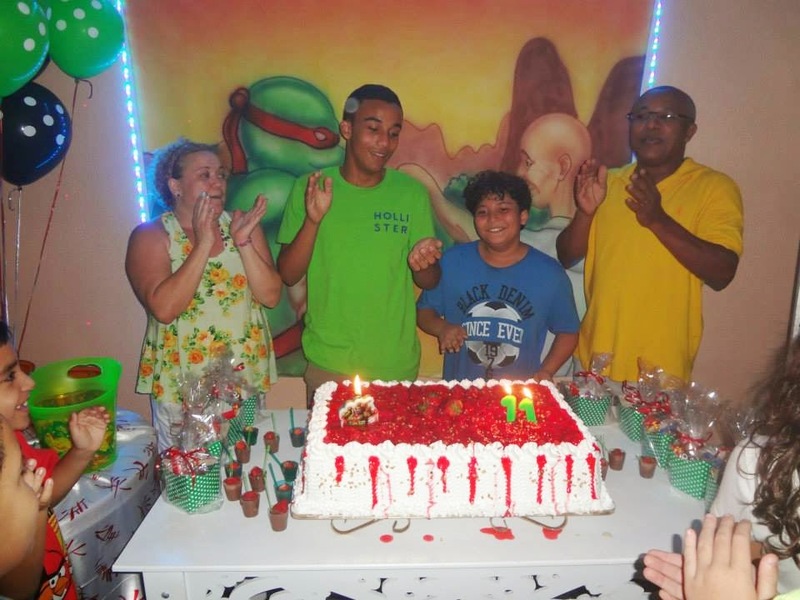 We took pictures with Maicon, and we all witnessed the dedication of his parents with his birthday, and it was interesting once again remember the Si Fu. 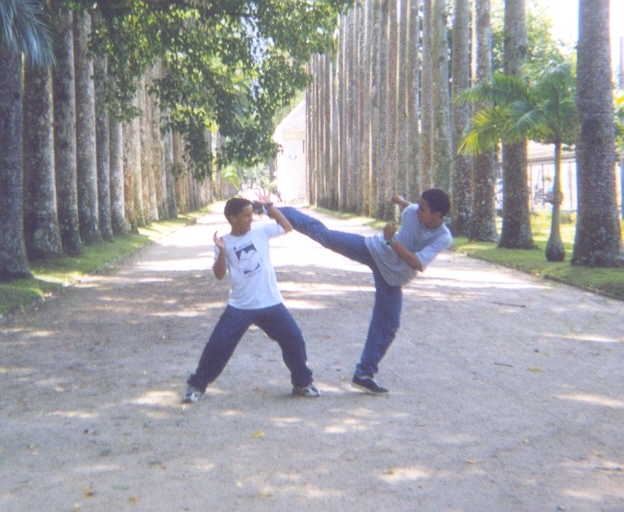 I do not know you who read the blog if you can count how many times I write: "And then I remembered the Si Fu ..." ..lol But is that at a time like that in the house of Maicon, not just me, as also Ailton and Rodrigo, were there getting so much love by the fact that one day, Maicon watched the Ip Man movie, and wanted to practice Ving tsun at any cost and found us. Se nesse momento, não tivéssemos tido a condição, de trabalharmos com o coração e prover experiências significativas como Si Fu nos mobilizou, talvez não estivéssemos ali. Ou talvez, teríamos comprometido o sonho do Maicon em praticar como em “O Grande Mestre”. Por isso mais uma vez, lembrei das pessoas que nunca conheceria e conheci, dos lugares que nunca teria ido e que estive, e a forma como fui bem recebido sempre. Tudo por causa do Kung Fu que o Si Fu me transmitiu. Realmente é uma divida impossível de se pagar. If at that point, we had not had the condition, to work with the heart and provide meaningful experiences as Si Fu mobilized us, we might not be there. Or maybe we would have compromised the dream of Maicon in practice as Ip Man. So once again, I reminded people that would never know and have met, the places I would never have gone , All because of Kung Fu that Si Fu passed down to me. It is really an impossible debt to pay.